One of the great pleasures in opening a new book is discovering that it is not quite like any other book you’ve previously read. You knit your brow, purse your lips, go “hmmm,” and maybe flip the pages to see if the rest of it is written in a similar fashion. If one were ignorant of such works, picking up a Shakespeare play or a novel by Dickins, this could be a valid reaction. We are so used to our books being written in a certain way – be they highbrow literary masterworks or lowbrow genre pieces – that we are at times caught off guard by one that is structurally or narratively different. When this happens we need to relearn how to read, if every briefly. The book challenges us to be active readers and not merely passive consumers of the written word. 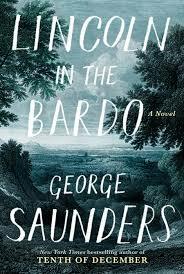 It is therefore apt that one of the leading satirists of consumerism, George Saunders, has unleashed such a strange, captivating, and at times confounding first novel as Lincoln in the Bardo. Arguably the most acclaimed short story writer of the past fifteen years, this is his first foray into longer fiction. It takes a little bit to figure out how to read Lincoln in the Bardo, but when one does, the book becomes a soulful meditation on death and life. Playfully anachronistic, at times quite funny, but also a deeply felt and moving elegy, Lincoln in the Bardo is not as pointed and sharp as Saunders’ story collections, but it does not need to be; this is a softer and warmer tale, one that does not need a satirist’s tongue, but a sympathizer’s heart. Set in 1862, Lincoln in the Bardo tells the story of the aftermath of the death of Willie Lincoln, President Lincoln’s third son, who died of fever in the White House and was buried in Oak Hill Cemetery in Georgetown. Over the span of a couple of nights, the President comes to visit his deceased son, opens his coffin, holds the boy’s corpse, and weeps over it. The novel is related by a series of spirits who inhabit the cemetery. Ghosts such as Hans Vollman, who was killed when a beam in his printing office fell on him; Roger Bevens III, who slit his wrists when his homosexual lover rebuffed him, preferring to “live correctly;” and the Reverend Everly Thomas, the only one of the numerous spirits that inhabit the cemetery who knows he is actually dead. This existence is the Bardo, the Tibetan concept of an in-between place that comes after death and prior to rebirth. None of these characters – except for the Reverend – know that they are actually dead. Rather they believe themselves to have fallen into “sick forms,” refer to their coffins as “sick boxes,” and believe that once they are mended they will resume their lives. Only those who have accepted their fate, however, can move on. This moving on is described simply as matterlightblooming. To the Bardo is brought the recently deceased Willie Lincoln, who is young and scared and soon befriended by many of the Bardo’s inhabitants. Soon after the President arrives, a weary, tragic figure, immersed in grief and sorrow not just for his son, but also for his country. There he grieves over his dead child as the spirits of the Bardo peak inside his head and try to get him to move on and help persuade young Willie to move on as well. Contrary to the title, the novel is less about Lincoln and much more about the inhabitants of this middle ground between one life and the next. On the one hand they are comic figures, Roger Bevins manifests with a multitude of arms and eyes; Hans Vollman, who is described constantly as having an oversized male member (and who died the night before he was to consummate his marriage with said member); various other minor characters – old maids, former slaves, soldiers, etc. On another hand, these spirits are trapped in a limbo, one from which only self-realization can set them free. The only way to proceed to the afterlife (or rebirth) is to accept death and to surrender one’s worldly desires. But in time, she went. As these young ones should. As most do, quite naturally. Rather than have the name of the speaker above it, like in a play or script, it is below as in a quotation. Similarly, there are several chapters containing quotes from various historical texts. All of these citations – be they real life actors who wrote what they witnessed or the invented characters of the Bardo – are reminiscent of Ken Burns’ style of documentary filmmaking. It is impossible not to think of these voices spoken by Sam Waterston, Jason Robards or David McCullough, serious, gruff and so very historical. Is Saunders’ parodying Burns’ Civil War series and the high-minded seriousness of its tones? Perhaps. This rolling pseudo-dialogue makes Lincoln in the Bardo a seemingly quick read. (My Kindle app said it takes on average four and a half hours to read a 343 page novel.) But to devour the book in one or two sittings would be a mistake. A similar error would be to read chapter-to-chapter. There are 108 chapters and most take less than three minutes to consume. When read in medium sized chunks, however, the small bricks of chapters begin to build into a powerful emotional narrative. There is a genuine depth of humanity to be found in Lincoln in the Bardo. Part of this stems from the character of Lincoln himself, who is – like Hamlet’s father’s ghost – a minor character who has an disproportionate power over propelling the narrative forward. Lincoln was a real man, but we have built him into a myth in the hundred and fifty years since his death. Saunders does not shy away from the mythmaking. The President affects the spirits of the Bardo in a similar fashion as he seems to have affected the living he met in his life. Saunders’ is known for satirizing consumerism, a target much more savory than its elite cousin, capitalism. It is easy to mock the rich, the robber barons of society. It is more difficult to thread the needle and knock down our own greedy consumerist nature. There is no contemporary consumerism in the historical Lincoln in the Bardo. But there is still possession and the difficulty in unshackling oneself from it. Lincoln cannot say goodbye to his son; the ghosts cannot untether themselves from their lives and mortal desires. It is a deeper level of consumerism than merely craving the new iPhone; this is possession of life and love, the love of others, the memory and desire of what has been lost, and the difficulty – but necessity – in letting go. Lincoln in the Bardo at heart is a ghost story whose predecessors are Spoon River Anthology and Our Town, both vital pieces of middle Americana that both satirize and embrace the quaintness of small town life. While owing a debt to these two works, this is uniquely Saunders’ ghost story, one that blends the Eastern Tibetan philosophy of the Bardo with the very Christian concept of Purgatory. Like all great ghost stories, this one leaves the reader with a sense of unease, that things have been left unfinished, that the story is somehow not quite complete. Perhaps it is the simultaneous smallness and largeness of the narrative: set over one night, short chapters, a quick “page turner” of a novel; but also large in theme and grand in its placement within the American landscape, utilizing one of the great figures in the nation’s history. It is a ghost story that keeps one up at night, not out of fear, but wonderment at our always shaky state of existence. © 2019 Vespucciland. All Rights Reserved.